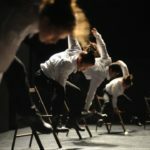 In this workshop we will learn a piece of the iconic choreography ‘Echad Mi Yodea’ by Batsheva Dance Company, choreographed by Israeli choreographer Ohad Naharin. Naharin’s signature style and technique has developed during his time with Batsheva. His style is distinguished by stunningly flexible limbs and spines, deeply grounded movement, explosive bursts and a vitality. His dancers do not rehearse in front of a mirror as this enables them to move away from self-critique and allows them to feel the movement from within. In this workshop we will warm up using Gaga. Naharin developed improvisation technique Gaga. A practice that resists codification and emphasizes the practitioner’s somatic experience, Gaga is importantly labeled a movement language rather than a movement “technique”. Gaga classes consist of a teacher leading dancers through an improvisational practice based on a series of images described by the teacher.